The UCL Institute of Immunity and Transplantation (IIT) held its annual open day on 21 June, where students found out about ground-breaking work being carried out by its reseachers. 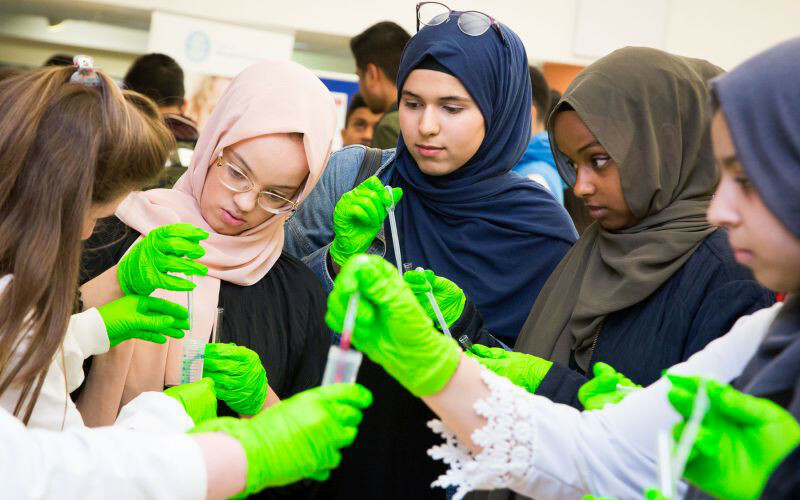 Over 60 students from schools in London and the south east were immersed in the advanced clinical research which happens at the UCL Institute of Immunity and Transplantation (IIT), located at the Royal Free Hospital, during the institute’s annual schools open day on 21 June. Leading biomedical scientists shared the latest developments in their research with the students. There were presentations on viruses, transplant immunology, and how vaccines work in older people. Hands-on activities such as using a pipette, viewing live cells under a microscope to understand their structure and scope, separating blood into its different components and inflating a sheep’s lung were all part of a busy afternoon for the participants. “Every year it is wonderful to open our doors to young people. It gives them the opportunity to see us at work and have an insight into the research that is going on almost on their doorstep, and it is refreshing for us to be challenged by their questions and interest,” says Professor Hans Stauss, director of the IIT. The presentations included a report from Emma Morris, Professor of Clinical Cell and Gene Therapy. During this year she has been working on a project with year 12 students from Graveney School in Tooting south London. This has involved molecular biology experiments in the school and at UCL to generate tools for cancer immunotherapy with gene-modified immune cells. The UCL Institute of Immunity and Transplantation is a world leading research centre on the human immune system. It brings together doctors, nurses, scientists and patients who are all focused on testing new medicines and therapies, and methods for traditional and stem cell transplantation. This means the timeframe for developing new treatments for patients will be substantially shorter. Research teams are working on diseases that affect many people in our local communities including diabetes, hepatitis, and cancers. Construction is underway for a new home for the IIT next door to the Royal Free Hospital. This will be known as the Pears Building and will be completed in autumn 2020. As a dedicated, modern research facility it will offer more opportunities for young people to engage with the clinical research that will be carried out there.